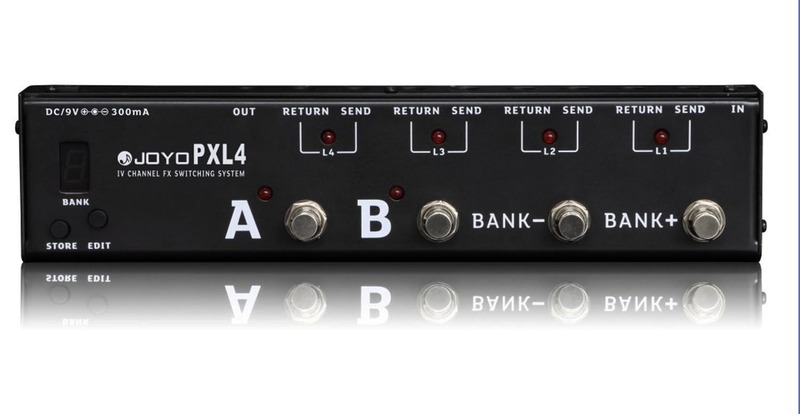 The PXL4 is a programmable FX pedal switching system for guitarists, and bassists that use multiple effect pedals in their set up. 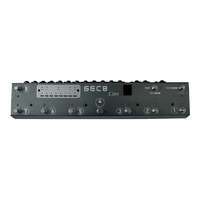 The unit has 2 separate banks with 8 possible programmable combinations on each, for a total of 16 presets. 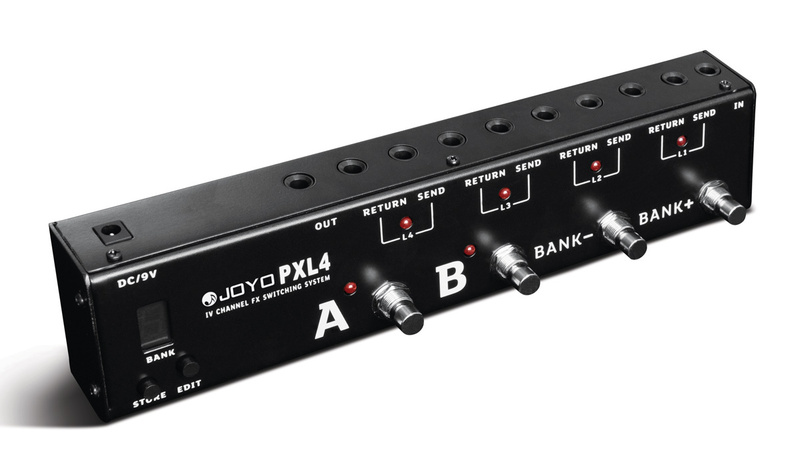 Recalling any of your 16 presets can be done easily and without noise thanks to the true bypass switching employed by JOYO in the PXL4. 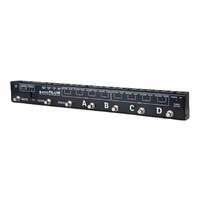 This style of switch will eliminate any discernible "pop" sound when switching between different presets and wont effect the tone of your guitar or effects in the process. 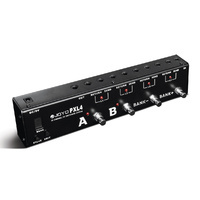 With 4 separate Effects send/return channels, you can take full control of your set up through the PLX4. Placement of either a single pedal on a bank, or grouping multiple pedals to form a loop on another will provide you with a specific sounds that can be programmed and switched between in an order that is the most suitable for you. The PLX4 will let you take the focus away from where your feet land on your pedal board and let you concentrate on your playing. 16 presets combinations over 2 Banks. Connection: 1/4" jack input and output connectors. This controller is invaluable if, like me, you use multiple effects combinations that you need to switch between, on the fly, during performance — it avoids the frantic “pedal dance” between numbers where you need to hurriedly cancel some effects and turn on others. 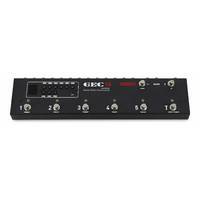 Having owned and heavily used the PXL4’s bigger brother, the PXL8, for the past two years, I had no hesitation in ordering this one from Swamp when I needed another controller for a smaller pedalboard. (At various times, I play acoustic-electric and solid-body guitars, bass, mando, uke, baritone guitar, etc., so I do a LOT of instrument and effects switching!) 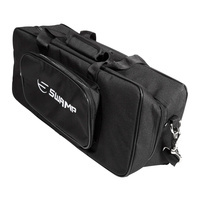 ….. Like the PXL8, this box is built like a tank, and programming it is a breeze (in fact, simpler than the PXL8, because you’re dealing with fewer ports). 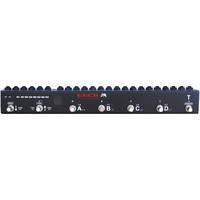 In its basic form, you’ll just use it to combine various pedal combinations into a bank slot e.g. Bank 1 button A might automatically give you Delay + Reverb, while button B could be set up for Reverb + Compression, or maybe just Distortion. With 8 banks, each with two combinations, you have 16 possible options, although I suspect even the busiest player won’t need all of those! ….. Incidentally, I use the PXL4 in a slightly unusual way — not just as an effects switcher, but also to toggle between two instruments e.g. bass and baritone guitar. To do that, I ignore the “Input” socket on the box, and instead plug the baritone directly into the Return socket of port 1, the bass into the Return socket of port 2, the baritone effects into port 3’s Send/Return, and the bass effects into Port 4’s Send/Return. 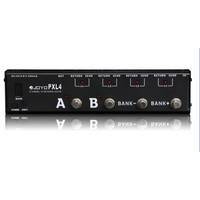 Then, it’s a piece of cake to set up the PXL4 to not only switch effects, but also to switch between instruments; for example, Bank 1 Button A selects ports 2 and 4, which automatically gives me the bass and its effects, and Bank 1 Button B selects ports 1 and 3 i.e. the baritone and its effects — a one-button instrument swap! 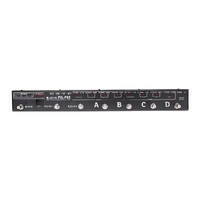 (As an aside, I use the PXL8 (with its 8 ports instead of 4) to also switch between amps (i.e. just one button swaps instrument, effects, and amp) when I’m toggling between an acoustic-electric and, say, a Strat.) ….. 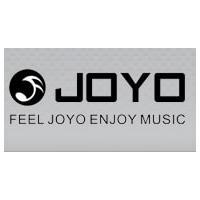 In short, the Joyo controllers, both PXL4 and PXL8, are both well-designed, robustly built, very reliable and, above all, quite versatile if you use your imagination. Highly recommended.